The Orange Wonder. In the early 1970s that hardy perennial 'Local Government Re-organisation' was in the air again. There was talk of a 'Super Council' incorporating the Mid-Cheshire towns and stretching all the way to Sale in what is now Greater Manchester, but, as we know, Middlewich eventually became incorporated into the 'District of Daneborough' which, by some municipal sleight-of-hand, was renamed the 'District of Congleton' at the last minute. 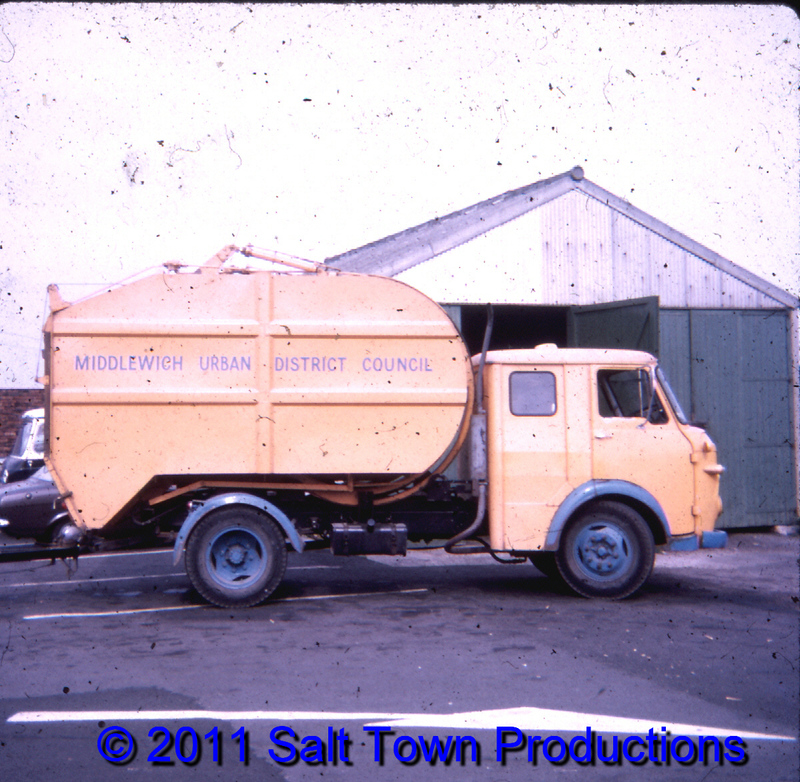 The old Middlewich UDC, in its final days, did something quite remarkable to its fleet of vehicles. The council's official livery had always been a rather dignified dark green but the council decided that, in the trendy 1970s, this was far too drab and, decided to go to the opposite extreme. Everything was painted orange and blue, including this dustcart which the dustmen promptly dubbed 'The Orange Wonder'. But it wasn't any old orange and blue, mind you. The official colours were 'tangerine and Delft blue'. It had always been the custom to paint the town's lamp posts in council colours too but, thankfully, we were spared that. The 'Orange Wonder' is pictured here at its depot on the Civic Hall car park. The buildings are still there and still, I think, in council use. For many people the Orange Wonder will always be associated with its most celebrated driver, George 'Scampy' Robinson. Dave Roberts If you're sharp-eyed and observant you'll notice that, even after all these years, and now that the Congleton Borough era has been and gone, traces of the old Middlewich UDC can still be found around the town. There's an MUDC sign in Chadwick Road and one at the entrance to Fountain Fields (although that one was, I think, put there by the CBC) and probably more. There are, too, many manhole and stop tap covers on our pavements with the council's name or initials on them. Of course, MUDC's main legacy is its successor, the Middlewich Town Council, which is one of the liveliest and most effective 'successor' parish councils in the country. Sherry Hill-Smith You make a wonderful tour guide for these glimpses into the past - your narratives are interesting and fun. Thanks Mr. Roberts, I'm happy to be in your audience. Dave Roberts Why thank you, Sherry. Much appreciated. Thanks also to Geraldine, Colin and everyone else who is contributing to our knowledge of these photos. Colin Derek Appleton And, of course, the shed in the background can still be seen on Civic car park !!!! not sure if its still in use though ? Sherry Hill-Smith Yes, thanks to them too. The shed, as of October 2010, was still in use. They keep a little street sweeper and a branded truck in there along with other assorted bits & bobs. Dave Roberts Of course, when you refer to 'a little street-sweeper' you mean a vehicle, rather than a little bloke with a flat cap and a ciggie hanging out of the corner of his mouth? Sherry Hill-Smith LOL! Like the little dude on the Aesop's Fables - with a twitching moustache and all! Dave Roberts I, like many others, am wondering if, as the years go by and Cheshire East & Cheshire West form joint committees and integrated county-wide services ('economies of scale', don't you know? ), and, at the same time, the town and parish councils are given more and more powers we might end up with the situation very much like it was pre-1974, with a de facto 'County Council' and smaller district councils. Then the whole reorganisation merry go-round could start all over again. Jonathan Williams You're right Dave. Thanks for the kind comments about the Town Council, and yes, we are being courted to take on more of the functions and services that have been carried out at Borough level since 1974. There will be big changes in the next few years, and the Town Council is gearing up to get ready...but we need the support of the people. First things first though.....I'll put in a requisition for a job lot of orange and blue paint !! Piecing the past together.....to promote the future.